Aberdeen manager Derek McInnes is looking for an improved display. 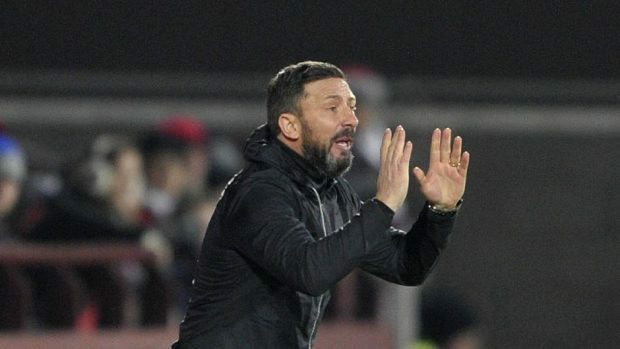 Aberdeen manager Derek McInnes believes the Reds have hit form at the right time as they brace themselves for a crucial top-of-the-table tussle with Celtic. The Scottish Premiership champions restored their six-point lead in the Premiership with a 3-1 victory against St Johnstone on Saturday but the Dons can halve the deficit if they beat the Hoops at Pittodrie a week tomorrow. Celtic are focusing on their League Cup semi-final against Ross County at Hampden on Sunday but, for the Dons, all thoughts are now on the Hoops and confidence is high following a run of seven wins and three draws in the last 10 league matches for Aberdeen. McInnes, whose side beat Dundee 1-0 at Pittodrie on Friday, said: “We could have made it easier on ourselves if we had taken more of our opportunities against Dundee but it was a strong performance from us. “I’m enjoying watching the team and there is a real determination about us. “The last couple of games at home before Friday were draws despite us putting in decent performances in both but a 10-game unbeaten run is a strong showing from us, although we want it to go as long as possible. Defender Mark Reynolds will return from suspension for the visit of Ronny Deila’s Hoops but McInnes has been impressed by the manner in which his side has coped without key players in their winning run. He said: “We were delighted we managed to get a result against Dundee despite being without Mark Reynolds, Willo Flood and Ryan Jack. Celtic will have a new face in their line-up in the shape of new signing Erik Sviatchenko but McInnes is hopeful he will also be able to add to his squad. Paul Quinn is expected to leave Pittodrie this week to complete his return to Ross County and the search for reinforcements is well under way at the Dons. McInnes said: “We’re spinning a lot of plates at the moment and we would like to do something but that could mean moving one or two on to other clubs or out on loan to free up wages.